The IUCN Red List status update released today contains a small glimmer of hope for mountain gorillas found in just two places on earth. The IUCN Red List status update released today contains a small glimmer of hope for mountain gorillas found in just two places on earth. The great ape's status has now been changed from 'Critically Endangered' to 'Endangered' as survey results released in May this year showed a fragile increase in numbers in the transboundary Virunga Massif. The Bwindi Impenetrable National Park in Uganda where the rest of the sub-species is found. The findings were the result of intensive surveying coordinated by the Greater Virunga Transboundary Collaboration and supported by the International Gorilla Conservation Programme (IGCP – a coalition programme of Fauna & Flora International and WWF) along with other partners. Despite the good news, the survey also showed that wire or rope snares continue to threaten the species along with new threats looming large on the horizon, including climate change, infrastructure development and the ever-present spectre of disease. This is why today's announcement must be seen as a critical step forward but still a long way from ensuring an environment where the mountain gorilla can survive and thrive without depending on conservation efforts. As Anna Behm Masozera, director, International Gorilla Conservation Programme, a programme of Fauna & Flora International and WWF, said: “The Mountain Gorilla is today better off than it was even a decade ago thanks to the incredible commitment and efforts from so many individuals and institutions – from park rangers to policy makers to community members – and the donors and tourism industry who support these efforts. However, the future for mountain gorillas is equally hopeful and challenged, as we face the threats which could quickly undo the gains we’ve made – from the introduction of existing and emerging human disease to these subpopulations to the loss of protected habitat from infrastructure development. 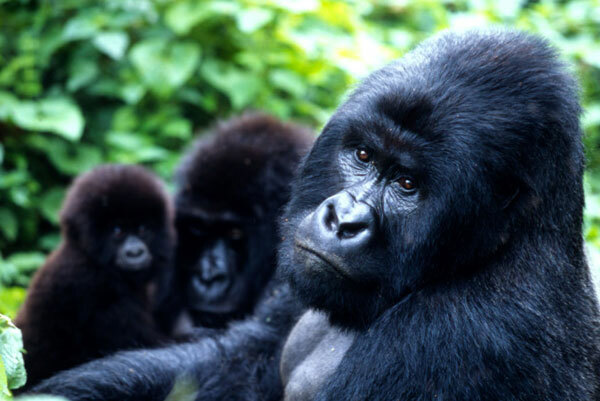 Safeguarding the Mountain Gorilla from these preventable threats should be our urgent priority." The latest update of the IUCN Red List also saw the status of the fin whale being revised from 'Endangered' to 'Vulnerable'. Mountain gorillas, Virunga National Park, Democratic Republic of Congo.